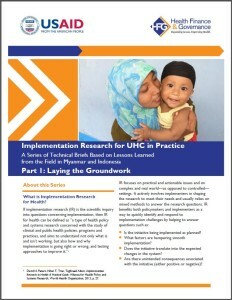 Resource Description: This is a series of three briefs, titled, Implementation Research for UHC in Practice – A Series of Technical Briefs Based on Lessons Learned from the Field in Myanmar and Indonesia. 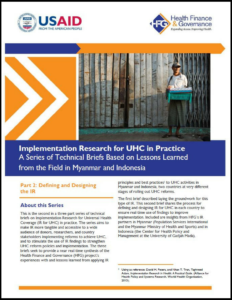 The series follows USAID and HFG collaborative experiences and lessons learned in two countries—Myanmar and Indonesia—that are at different stages of rolling out UHC, are undergoing different political transitions, and have different competing political priorities. While the country contexts are very different, however, one feature they have in common, and share with many other low and middle-income countries, is unfamiliarity with the purpose, methods, and value of IR, especially when applied to UHC-related policies and interventions. The aim is to make the value of IR more tangible and accessible to a wide audience of donors, researchers, and country stakeholders implementing UHC; to sensitize this audience to the challenges of context, timing and sensitivity when laying the groundwork for IR for UHC; and to stimulate the use of IR findings to strengthen UHC policies and implementation. These technical briefs on IR for UHC support USAID priorities in both countries and embody USAID’s collaborative approach to monitoring & evaluation. The series will include the following three technical briefs: 1) Laying the Groundwork, 2) Defining and Designing IR, and 3) Implementing IR: First Cycle Lessons Learned. 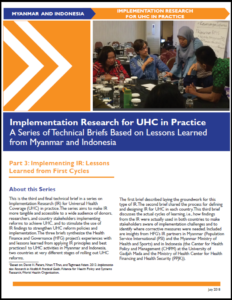 IR can be a particularly effective mechanism for advancing both countries’ UHC agendas, whether it is building IR into UHC design and early implementation in Myanmar or using IR to inform mid-course corrections in the rollout of the UHC roadmap in Indonesia. For IR to be truly effective, however, the time and care to lay the groundwork for IR and orient government and other stakeholders unfamiliar with IR should not be underestimated. In some ways the initial phase in IR is similar to many other types of research in that clearly defining the research questions is key to determining the methodological approach and the data collection and analysis plans. Yet, getting started with IR can also be more complicated, more sensitive, more time consuming, and require different approaches and capabilities than the typical research project.